If you have been paying attention to any of the food shows you might have noticed a trend of adding poached eggs to everything. 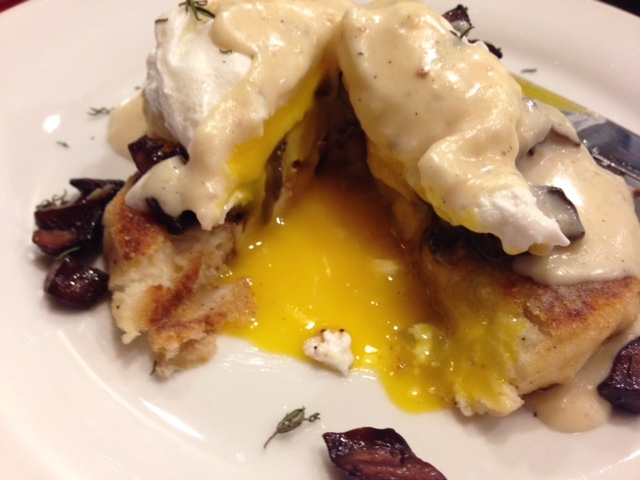 Some might ask why are eggs the new darling of the culinary scene? This month I will focus on the poached egg. This one simple style of cooking an egg can be used across a multitude of dishes. A tossed spinach salad, green beans or Asparagus can be elevated to a whole new level by adding a poached egg on top, it becomes a light meal. Adding a poached egg on a hamburger transforms it from simple back yard staple to gourmet fare. I have been utilizing poached eggs on several dishes recently, as an appetizer I toast brioche bread, layer over sautéed mushrooms and top with the egg. For morning after re-overs I have pan fried Thanksgiving dressing (some might say stuffing) and layered with smoked turkey and the egg with a bit of gravy. Of course the staple of any brunch is Eggs Benedict with the English muffin, ham, egg and hollandaise. Today we will take a more Southern spin on this with Eggs Beauregard, but first some technique. To poach any thing is to cook it in gently simmering liquid. To poach an egg we will use water with just a bit of white vinegar and salt. In a two quart sauce pan half full of water I add half a teaspoon of salt and a teaspoon of vinegar. The vinegar helps the ‘white’ (see side bar) stay more intact. Bring the water to a temperature of about 160-170 degrees. It should form tiny bubbles which cling to the sides of the pot but they are rising to the surface. I have heard this called bringing the water to a shimmer. Crack the egg into a mise en place bowl or custard dish. This is done so the egg can be inspected for any shell or other imperfections as well as helping ease the egg into the poaching water. With a slotted spoon stir the water to start a gentle whirlpool and carefully dipping the edge of the egg bowl into the pot let the raw egg slip into the water. The whirlpool effect helps keep the egg from sticking to the bottom of the pot. At one min take the slotted spoon and gently roll the egg over in the pot. At a minute 45 to two minutes dip the egg up from the water and drain. You can place the poached egg in another container or directly onto the dish. Prepare your biscuits as your mama taught you. If you don’t know how to make great biscuits or simply don’t want to take the time those frozen ones at the market are pretty good. Cook your sausage and make up a quick gravy from the pan drippings. If you can’t make gravy you better forfeit your Southern card and just go out for breakfast. Now it’s as simple as splitting the biscuit, placing the sausage on it, layering the poached egg on that and artfully placing the top of the biscuit, drizzling with the gravy and finishing with a grind of fresh pepper. Serve this at Easter Brunch and it will be a hit. I guarantee it will make some bunny very happy. If we focus on the edible parts it’s the last four items, the Chalazae you probably have never heard of but it is the white stringy stuff which actually hold the yolk in the middle of the egg. In custard recipes you should remove this as it creates a lump when cooked. The Vitelline membrane is the clear casing which holds the yolk. The Albumen is the clear viscous liquid around the yolk that when cooked turns white. The Albumen (Latin root Albus or ‘white’) has over 40 different proteins and the yolk contains not only iron, vitamin A & D, phosphorous, calcium, thiamine and riboflavin but it also is a great source of lecithin which is a natural emulsifier. These properties are what make the egg so useful in cooking.